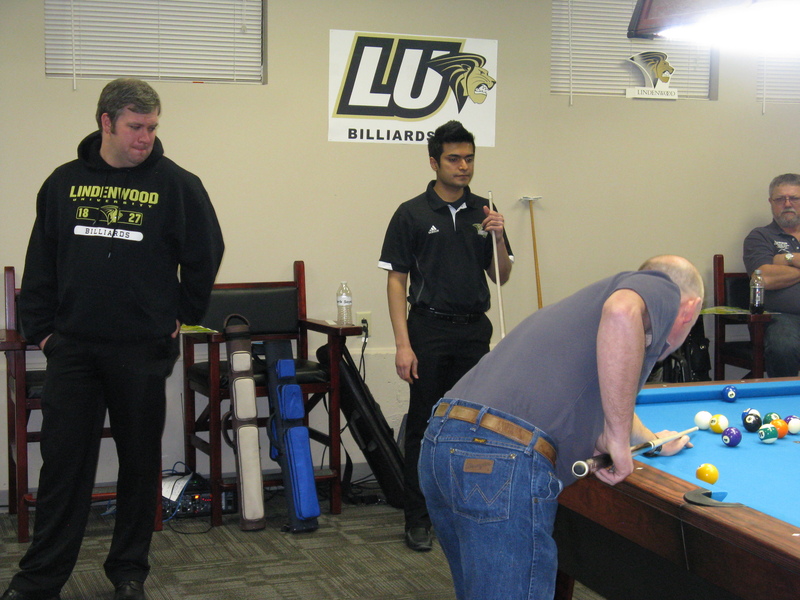 Last Saturday (2-8-14) was the match between the Durbin Destroyers and the Lindenwood Lions. 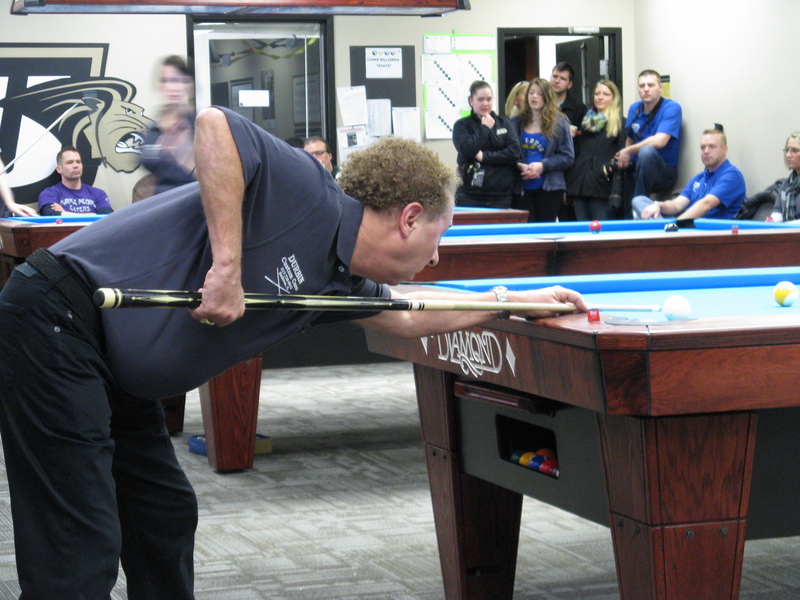 This is a friendly rivalry between Mike Durbin of Durbin Cues and Mark Wilson, the coach of the Lindenwood Lions pool team. 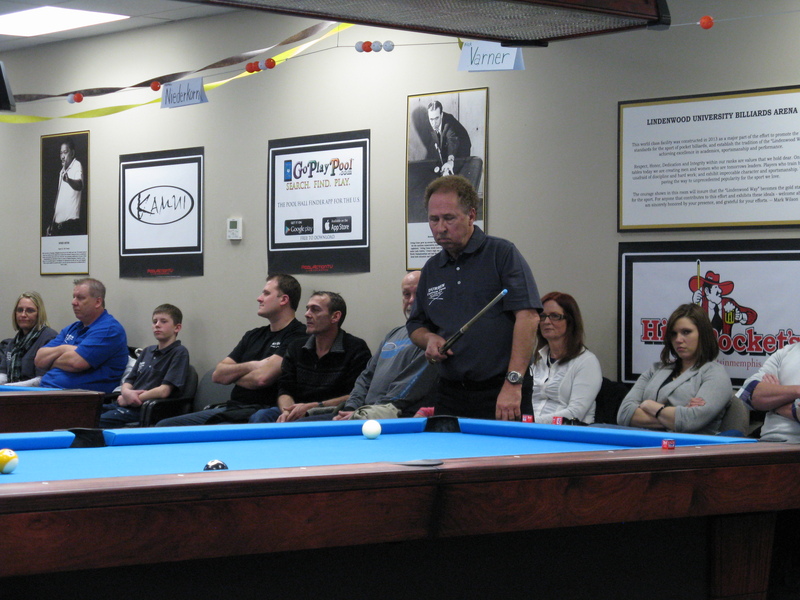 This year Mike Durbin rallied some pros to help win the cup back. He added Liz Lovely, Joey Gray and the BCA Hall Of Famer Nick Varner! It was a great match with amazing play from both sides but in the end The Lindenwood Lions ended up the victors with a final score of 18-14. 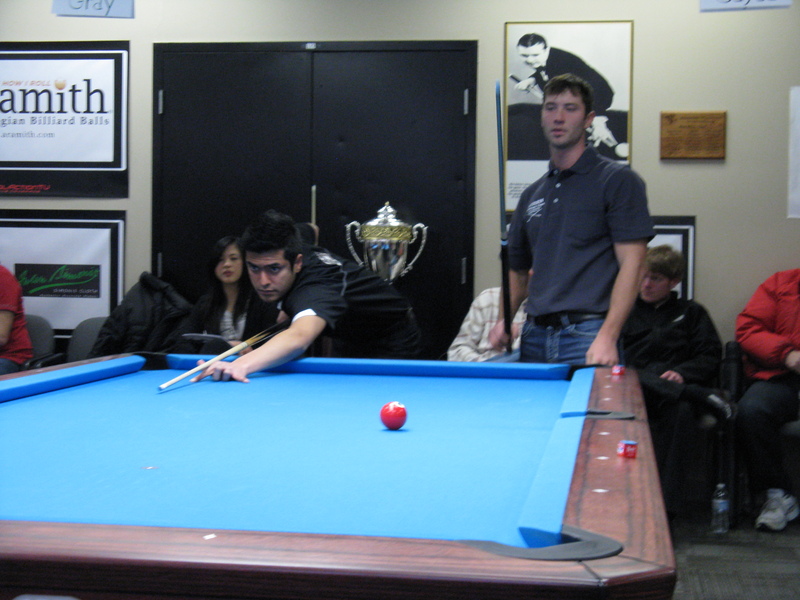 Landon Shuffet played for Lindenwood and won some key matches as well as Sharik Sayed but it took a team effort to keep the cup. 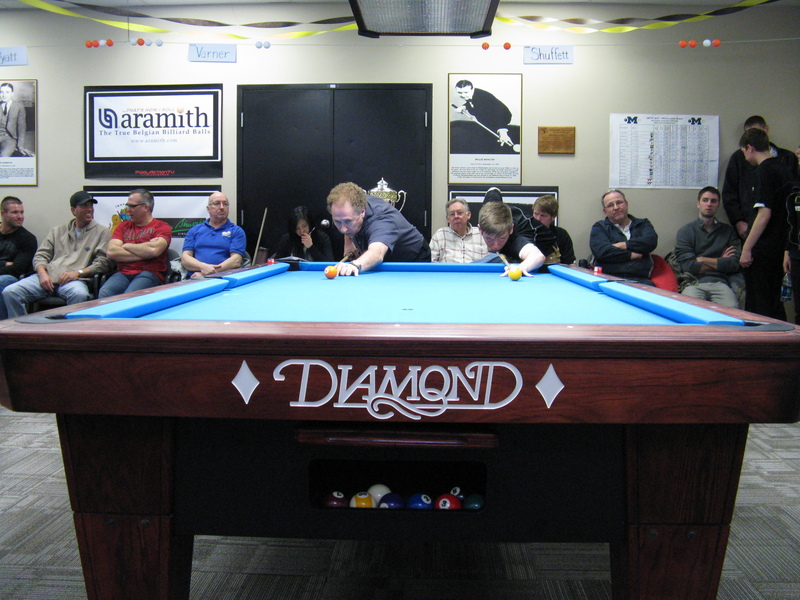 Ches Heitmeyer played excellent pool as well as Dan Otto and Sean Sommers. Some of the other players for the team that played although I didn’t get to watch them was Steven Wyatt, Jaydan Hergott and Matt Niederkorn. This is one article I hope to revisit 20 years down the road and say “Wow, look at the pics of those great players when they were young!” There is some serious talent on Mark Wilsons Lions. 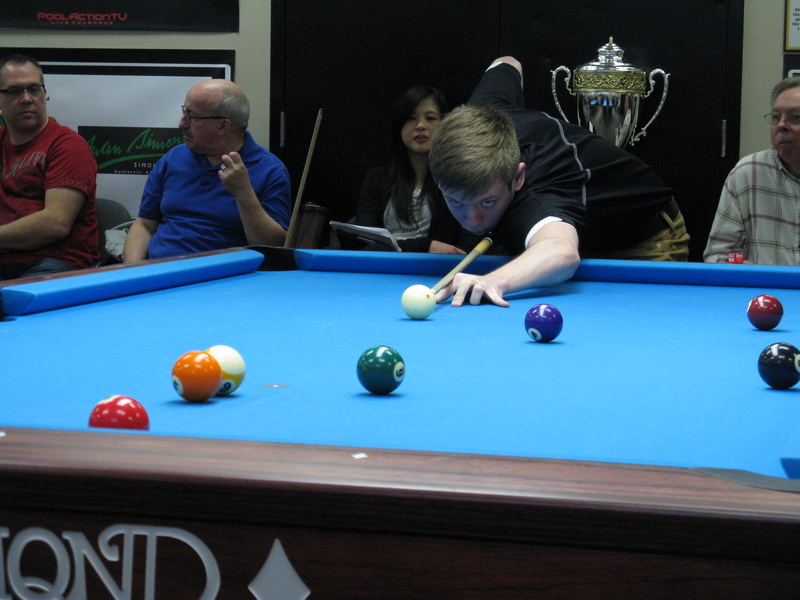 Landon Shuffet has already made some big waves in the pool world by man handling the great Earl Strickland last year in Tunica Mississippi playing 10 ball of a 10 foot Diamond table with pro cut pockets…..Landon steamrolled him to a 15-4 victory! Then there is Sharik Sayed. This guy is one of the nicest guys you will ever meet. Very down to earth and as smart as they come. He has a love for the game and takes his work seriously. They call him Shark for a reason. Next is one of my favorites Ches Heitmeyer. I met Ches a few years ago at a tournament that he was running. I was impressed by his devotion to improving his game. Ches will be one of those guys that never looses his passion for the game. He works hard and takes nothing for granted. He has more heart than most prize fighters and if you beat him today he will figure out a way to beat you tomorrow. 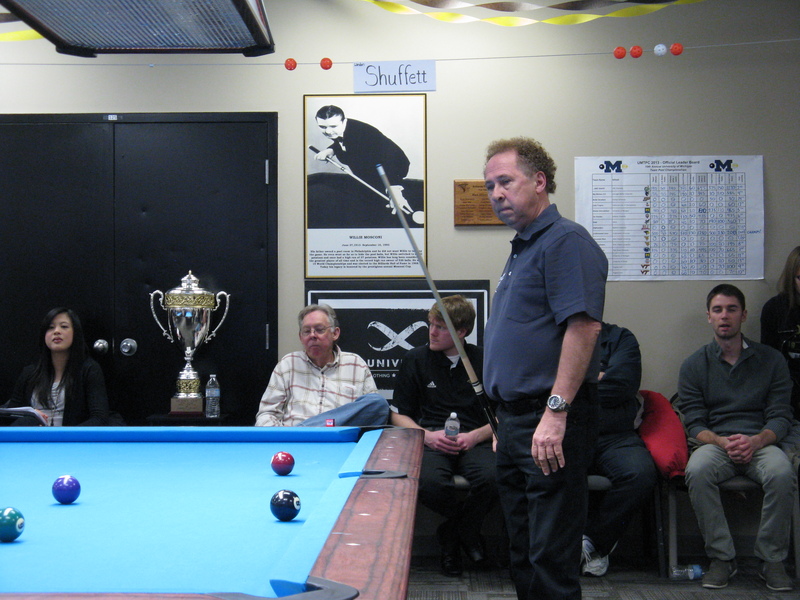 Dan Otto is simply one of the guys you love to see in the pool room. Talented and fun to be around. Dan’s game is even better than I thought it was the first time when he and I played a race to 3 in a short rack game of banks. I won the first game and he wasn’t having it. 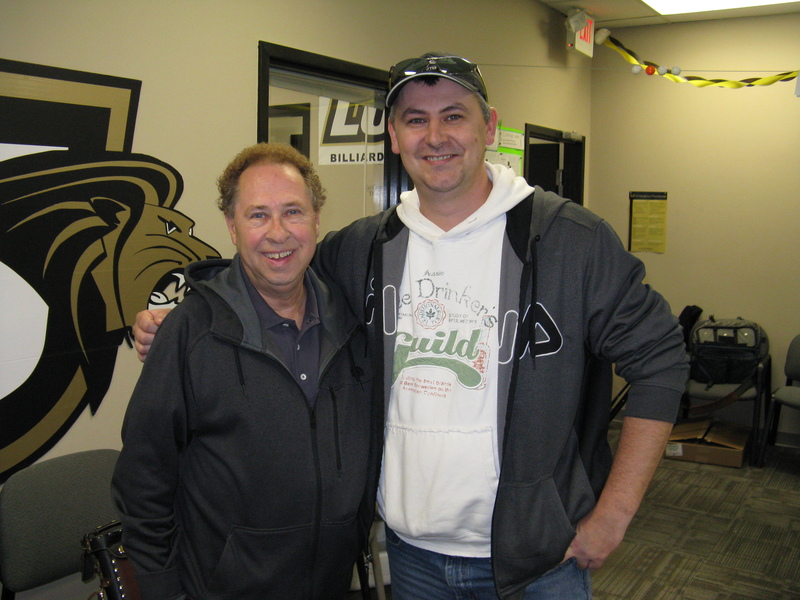 If I remember correctly he handed me 3 quick losses in a row! What can I say, banks ain’t my game! Sean Sommers is a guy that I can best describe as a slick player. I haven’t got to spend much time talking to him but I have watched him play enough to know that he has a deceptively great game. If he continues to take his game serious there may be no limit to what he can do with his game. By the way, Sean managed to go 4-0 for the day obtaining the best record of the day. There are several other players on the Lions team but unfortunately haven’t had the chance to meet them all. There is a girl named Brianna Miller and I hear through the grapevine that she’s got game. Serious game. There is one other person I would like to mention and his name is Remington Ludwig. 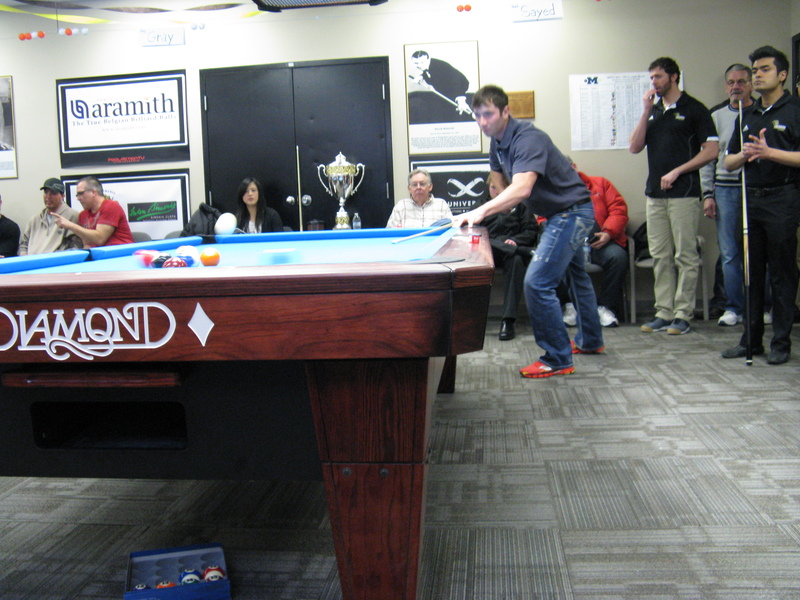 Remmy is just getting started when it comes to pool, but if he continues to learn at the pace he is showing now he will be taking down some serious games before you know it. Remmy is the kind of person you want on your team. He is genuine in his comments, thoughtful in his actions and serious in his dedication. And then there is their leader, Mark Wilson. I’m unsure of what I can say about this man that would make a person understand what exactly his impact on the pool world is. He is a great player and has played at the pro level for quite some time. But he is so much more than that. 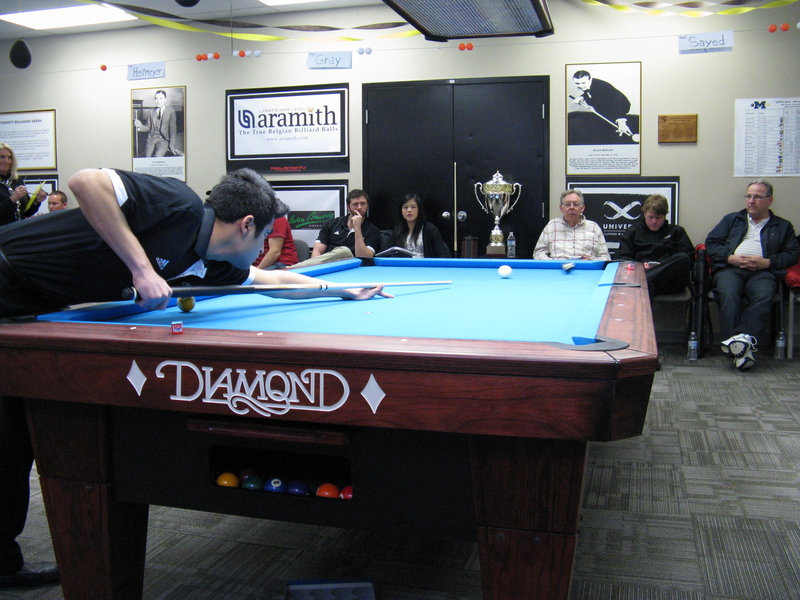 He is a insightful instructor that is sought out by amateurs and pros alike. He has recently be named as the captain for the 2014 Mosconi Cup team and yet that still doesn’t come close to being a worthy description. Maybe the best thing that I can say about Mark is that he is a leader in every sense of the word. He cares for his students and would do anything for them. He dotes on them like they were his children. He is on a mission to raise their game to it’s maximum potential and at the same time teaches them how to be quality people. 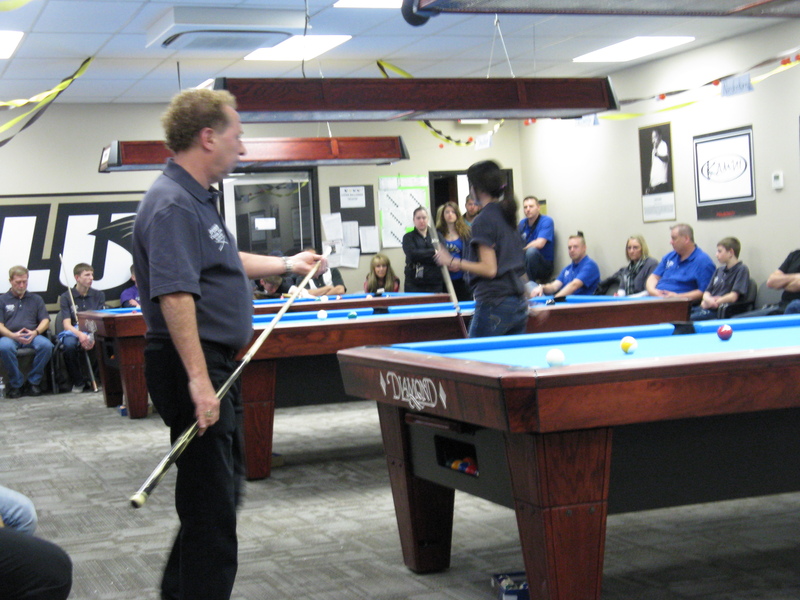 He respects the game and demands the same of his students….AND THEY DELIVER. 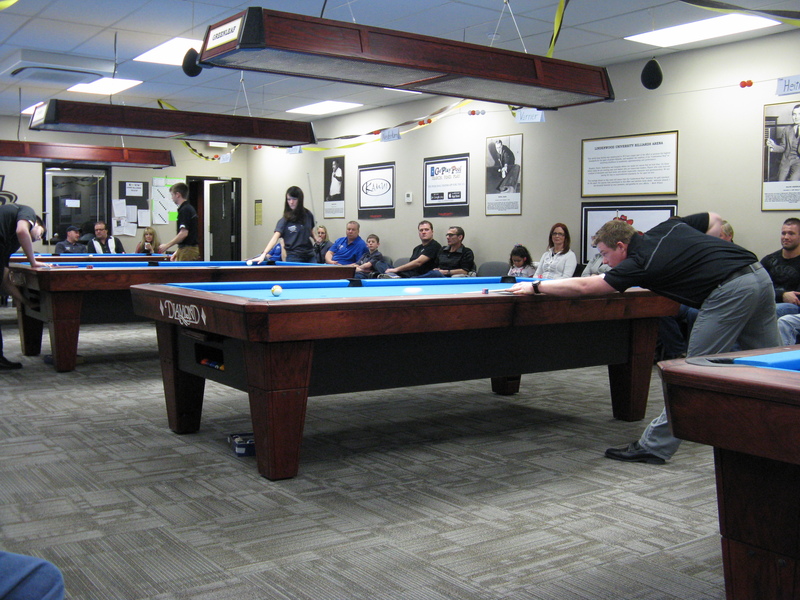 These students are some of the finest pool players in terms of skill and behavior that you will ever come across. Mark has led by example and when you are in his presence you will know what I mean. 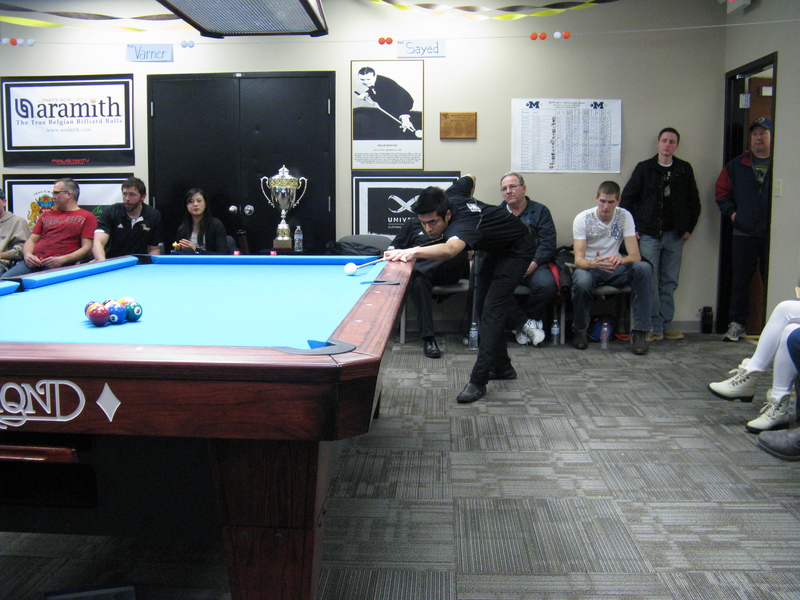 He is teaching more than pool and it shows. 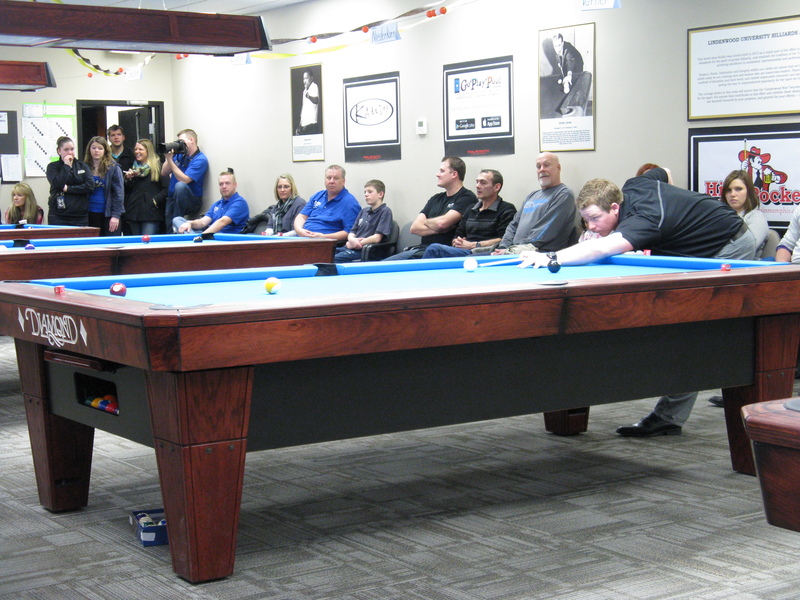 All you have to do is spend 15 minutes with some of his students and you will realize that never before have you met a group of pool players like this before. Mark is raising the game and those who play it ………THANK GOD! Well, enough about that, here are some pics from the day. Joey Gray and his flashy orange shoes! 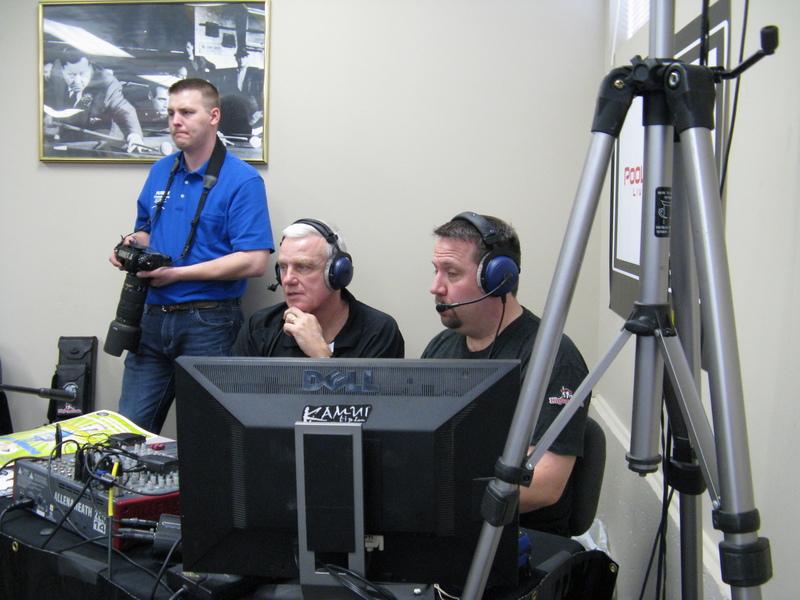 Mark Wilson and Jay Hansen commentating. 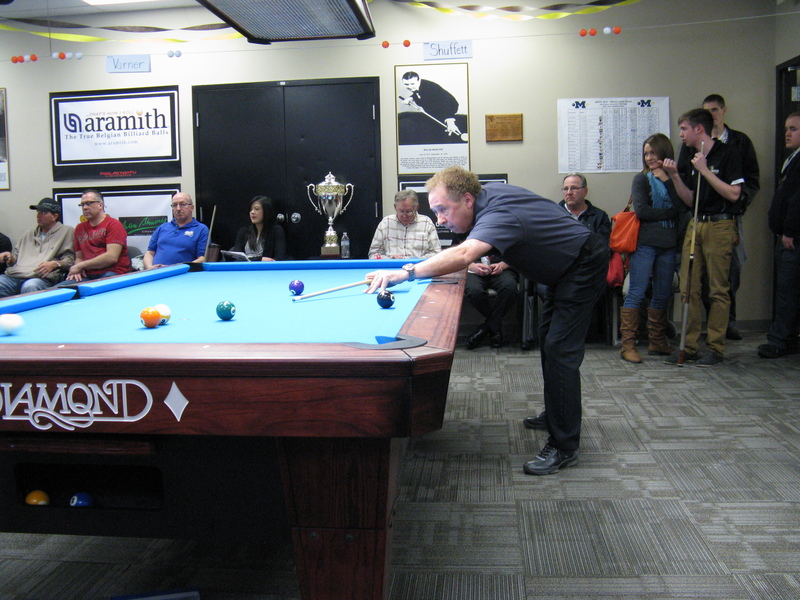 Jay Hansen is also known as “Big Truck” in the pool streaming world. Landon Shuffett and Nick Varner laying down the lag. Landon Shuffett–his focus is amazing. 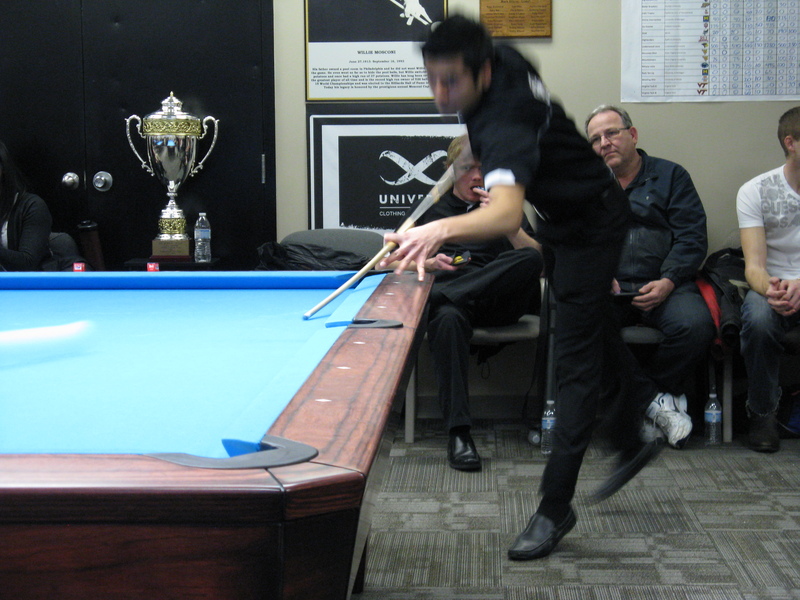 Sharik “Shark” Sayed Snapping the break! Earlier today I saw a post on my facebook page from David Sapolis. In it he quotes Forrest E. Morgan. 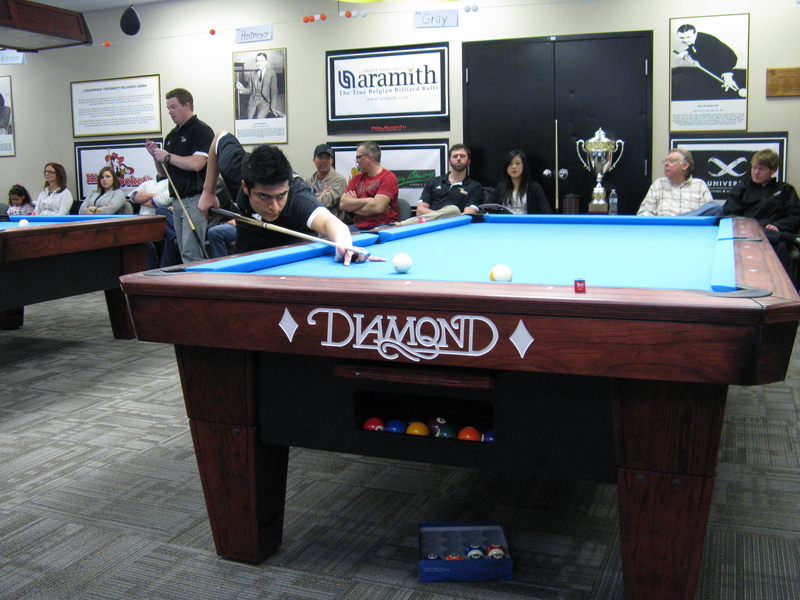 It is a excellent way to look at competitive pool. I have posted this with David’s permission, in it’s entirety for you to enjoy. You have to enter and exit the arena as a warrior. To be a warrior, you have to think, feel and act differently than everybody else in the room. You have to be one of those special people that is willing to go beyond the ordinary and towards the extra-ordinary. 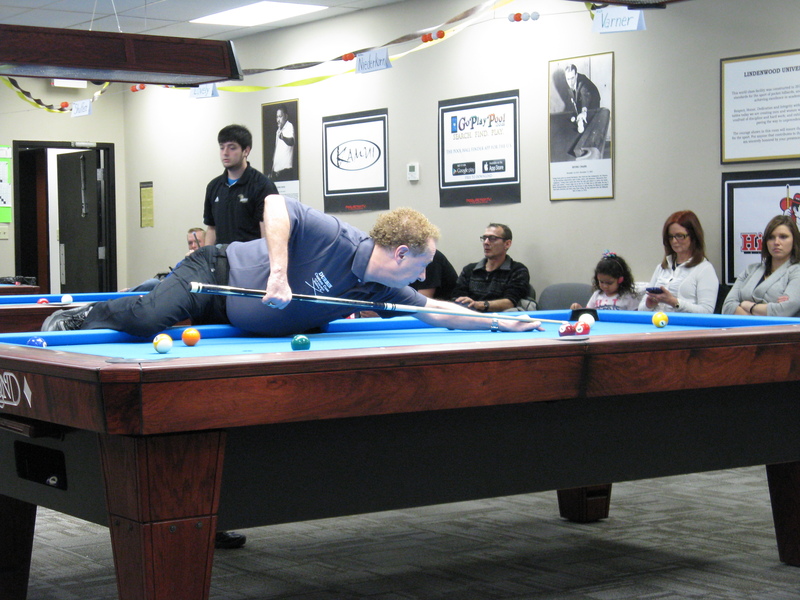 As Forrest E. Morgan tells us, you have to “set yourself apart from the rest of society by your personal excellence in everything that you do.” Not many pool players possess the ability, discipline, commitment, or determination to live up to that. To prepare your mind, your body, and your game for personal excellence you will need to exercise exceptional discipline and persistence in absolutely every aspect of your life. If everybody was able to do this, then everybody would be a champion. We know that is not the case. To be a warrior – to be a champion – it requires a commitment by which you hold yourself to a standard of excellence in everything that you think, everything that you say, and everything that you do. There is no room for weakness. There is no room for negative thinking. You have to conduct yourself in a way that displays, creates, promotes, and breeds excellence. Your mind must foster, nurture, and promote excellence. Competition is the stage for you to display and showcase the results of your commitment to excellence. Competition is what you have prepared for – competition is where everything counts. During your training you have starved yourself of competition. You have prepared yourself to enter competition ready to feed off of your opponent’s fear, nerves, and lack of confidence. You capitalize on each and every one of your opponent’s errors in judgment, in thinking, and in movement. You sense your opponent’s fear and indecisiveness as if you were a hungry lion tracking the blood trail of his injured prey. You sense your opponent’s downfall – and you sense his fear of the inevitable – and you are prepared to transform his imagined fear into a harsh reality. 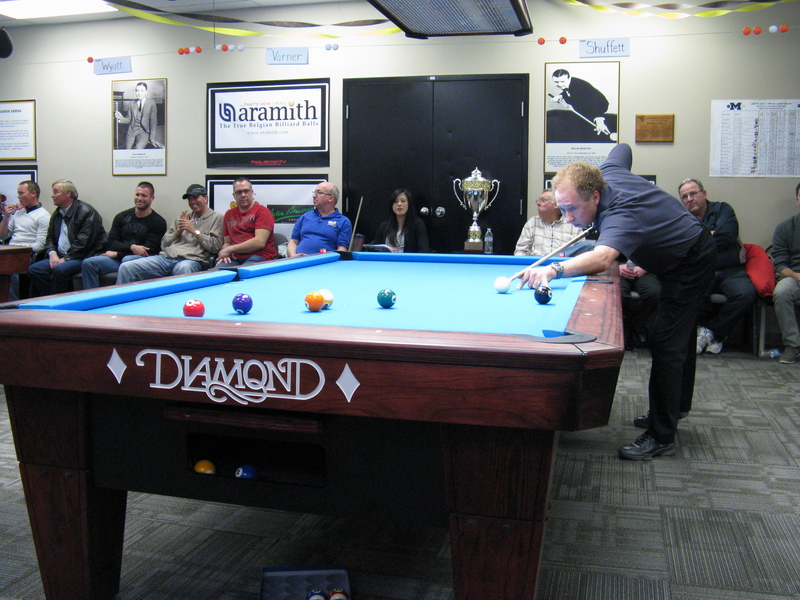 Last December I set up a lesson with a well known instructor named Mark Wilson. 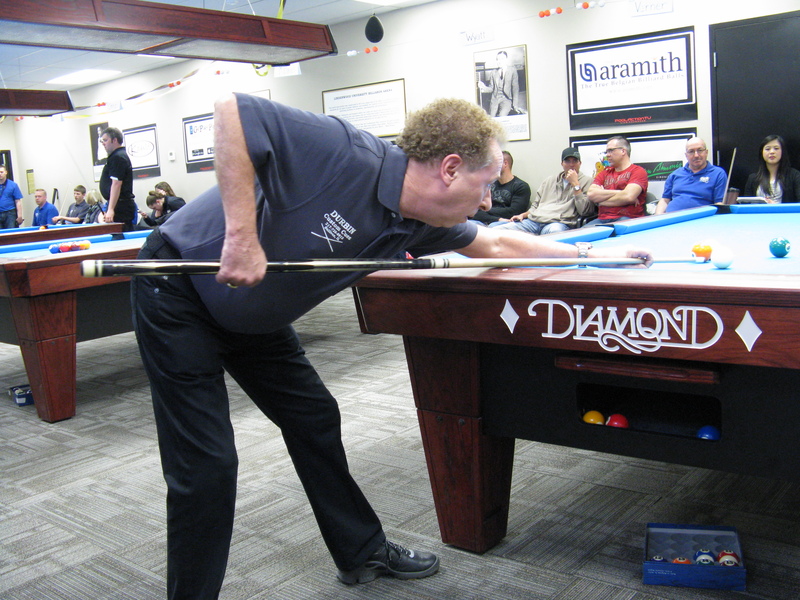 Mark has been a professional player and instructor for over 20 years. He has played all over the world and taught people from all over. His skill and spotting flaws in a persons game and knowing how to correct them has amateurs and pros alike seeking his guidance. The first thing I noticed about Mark was his passion for the game. He really cares about pools future and how to improve it. He has dedicated his life to improving how the game is played by others. The day of the lesson I wasn’t even sure we were going to be able to have it at all. It snowed all night the night before and road conditions were horrible. 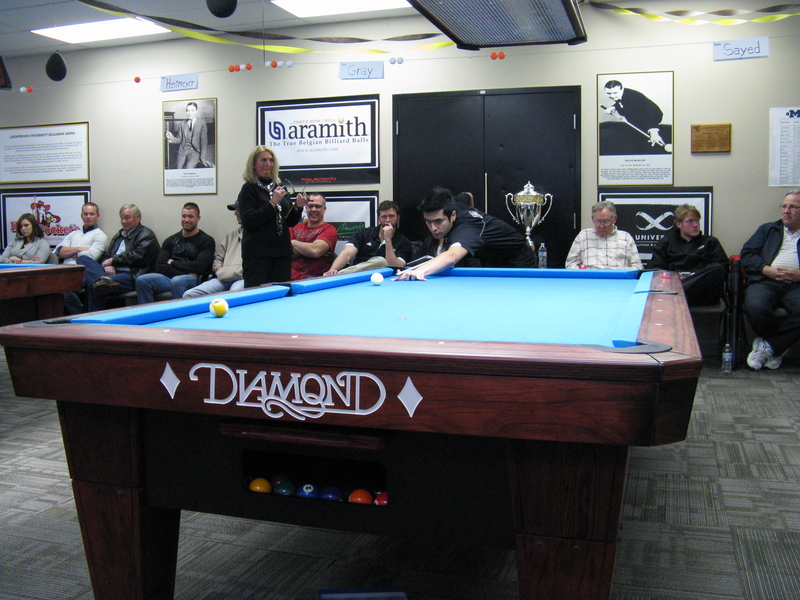 I had to drive 90 miles to meet Mark at Cue and Cushion pool hall in Overland Missouri (just outside of St. Louis). But the conditions were so bad it took over 3 hours to get there. 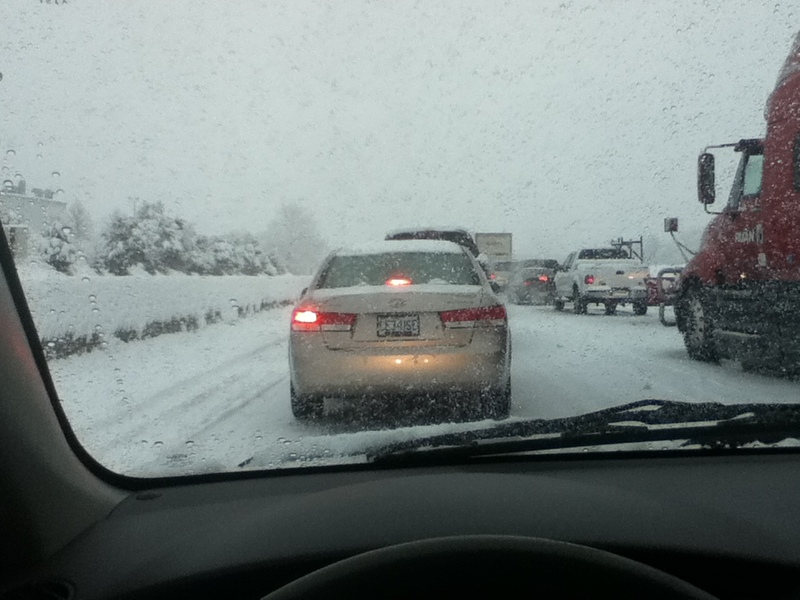 At one point were were stuck in traffic at a stand still for 1 hour without moving because there had been a bad wreck. Mark also had a decent drive ahead of him to get to the pool hall so I was impressed when he didn’t want to call off the lesson. I would have made it if I had to walk, that’s how bad I was looking forward to it! So, Mark shows up and right away he gets down to business. He starts me off with a series of shots to determine my skill level and to have a look at my stroke. Mark takes video of his students so he can show them their flaws, from their stance, grip, balance whatever. He starts me off with the basics and explains to me how important each one is and why. The whole time he weaves in a few stories and other items of interest so that he can maintain your attention. It was obvious that he put a lot of thought into his lessons. I really appreciated his attention to detail, his professionalism and his dedication to improving my game. I really felt that he cared as much about the way I play as I do. It wouldn’t be fair of me to tell you everything he taught me but I will say this, if you get the chance to work with Mark, you wont be disappointed. The lesson went on for about 8 hours, I stopped once for a restroom break for about 3 minutes and that was it. Here is a guy that had a little over a hour drive, in bad weather. Then spent 8 hours teaching me the finer points of the game. Then, had another hour drive ahead of him and only charged me $300.00!!! If you think that’s impressive than wait until you hear this. As our lesson comes to a close Mark asks me what hotel I was staying at. He said he would be willing to give me a ride there so my wife wouldn’t have to get out! (My wife stayed at the hotel while I was working with Mark, and did some shopping!) Mark said that he had to run by Lindenwood University first but he would drop me off after. 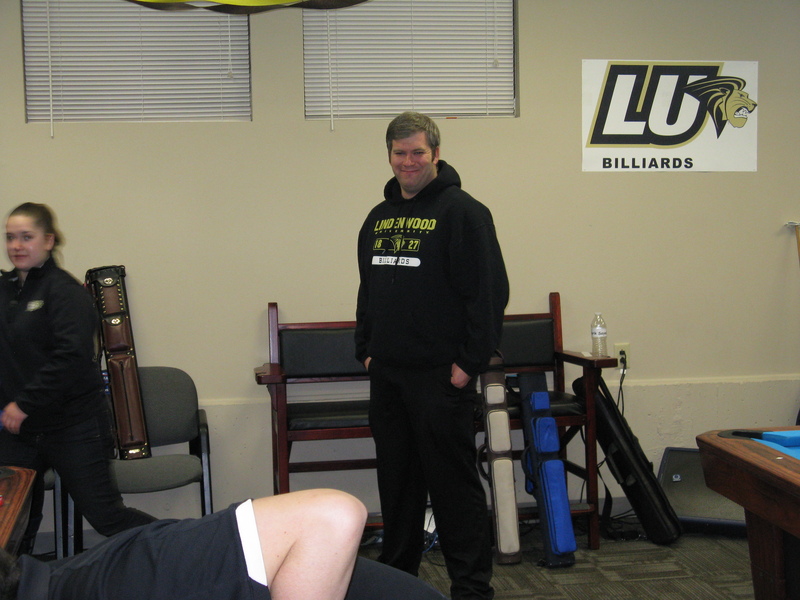 He said he wanted to show me the billiards program that they had started at the Unviersity and that he was the coach. So of course I want to go! So we head out to the school and Mark takes me around the campus and tells me about the history of the place. 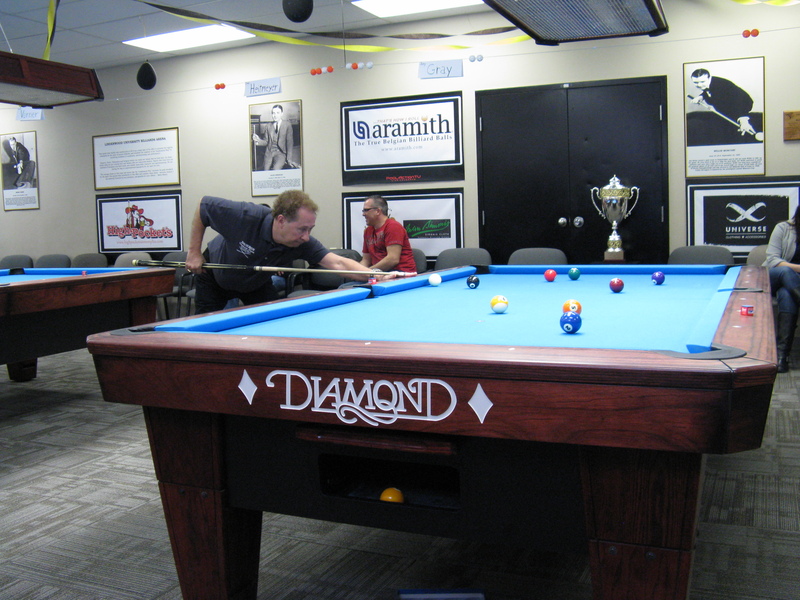 Eventually we get to the building where they set up a brand new pool room for the team. Only the team gets to use it, it’s not for the rest of the student body. They bought 4 brand new 9 ft Diamond tables and diamond lights. 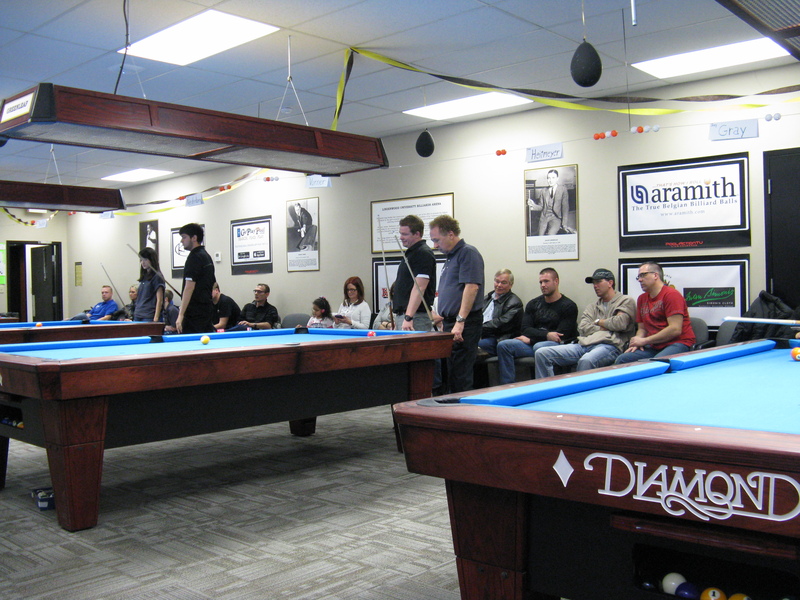 The tables are covered in Simonis tournament blue cloth and have brand new Super Pro Aramith pool balls! My dream room! For me this is like walking into a church! Mark said he had a few things to do on his computer and invited me to play some while I waited! He didn’t have to tell me twice! I played around for 45 min or so before Mark finished and by then my arm was about to fall off anyhow from shooting so much that day. So we packed it up and headed for the hotel. Mark dropped me off and gave me his number with instructions to call him in a couple of weeks to go over what I had learned and he would give me a few more things to work on for the future. I went back up to my room and told my wife how it went. I couldn’t believe the effort Mark puts into his teaching. He really cares about his students and it shows. It put a desire in me to really improve. He gave me the confidence and the knowledge to reach that next level and he showed me how I can continue to teach my self to improve. He even invited me to meet up with him at the Derby City Classic tournament and said he would introduce me to some of the pros and maybe play a few games with them! By the time the night was over my head was spinning. 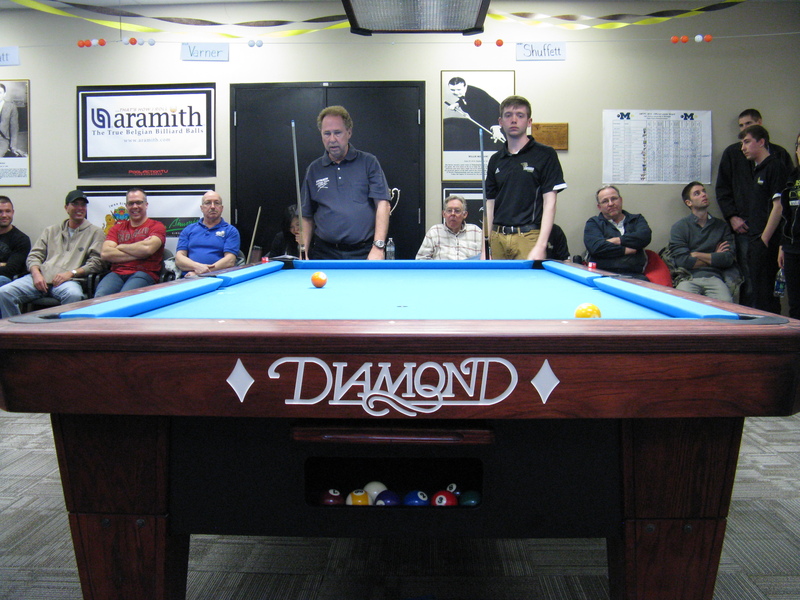 I had gone over a ton of info with Mark, he set me up with a solid plan to improve my game and has continued to talk with me over the phone and through emails to answer any questions and check up on my improvement. I told him I had a 9 ball tournament coming up and asked what he would recommend I do to get ready for it. He set me up with a excellent practice routine which I outlined in a earlier post. I can not recommend this guy enough. If you really want to break through to that next level of play I really suggest that you take some lessons from a professional. Obviously, I recommend Mark Wilson but there are other great ones out there and a few of them travel across the country teaching folks. 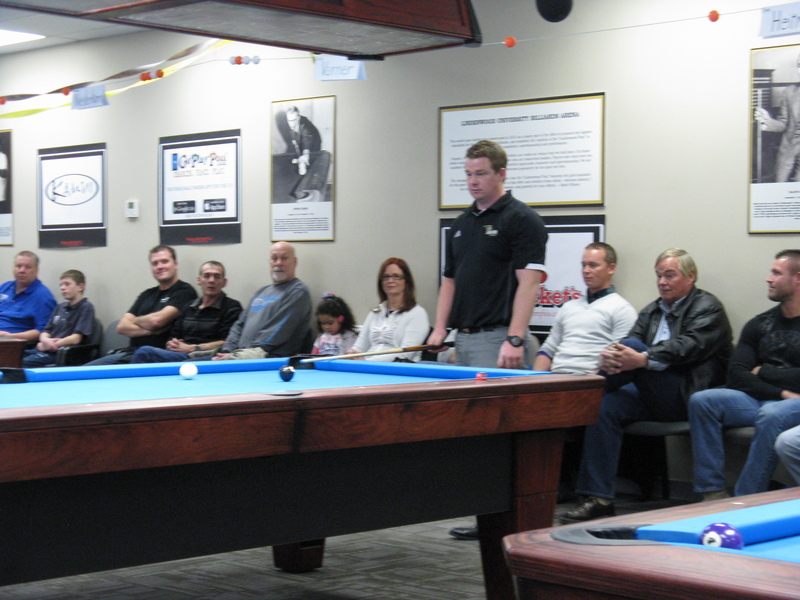 EDIT: While I was writing this Mark Wilson was selected as the captain for the 2014 Mosconi Cup American team! Congrats Mark, you deserve it.